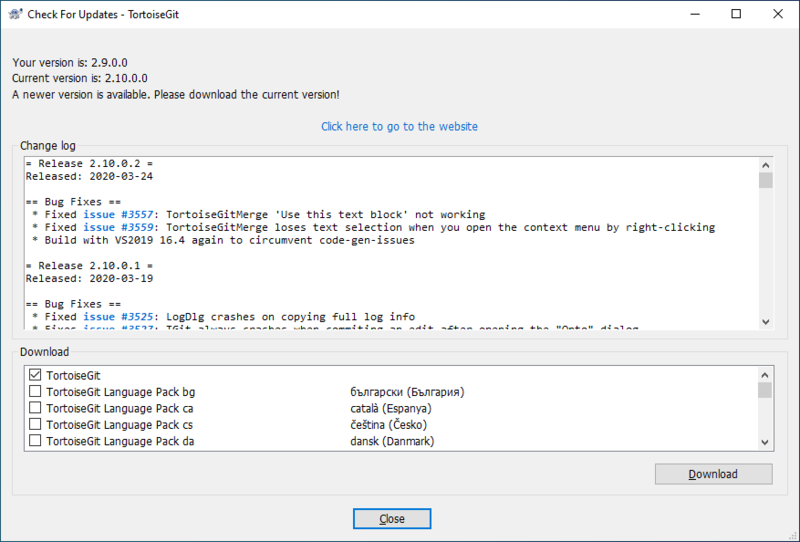 TortoiseGit checks if there's a new version available every week (or daily in a preview release). If there is a newer version available, a dialog shows up informing the user about that and allows to download/install a new version. If you're responsible for a lot of users in your domain, you might want your users to use only versions you have approved and not have them install always the latest version (or to save bandwidth or want to add some further notes for installation). You probably don't want that upgrade dialog to show up so your users don't go and upgrade immediately (to disable update checking at all (e.g. because you use group policies to deploy TortoiseGit, see the section called “Deploy TortoiseGit via group policies” and/or VersionCheck in the section called “Advanced Settings”). infotext=A new version of TortoiseGit is available for you to download! Clicking on Download downloads the selected files as well as their digital signature files (filename.asc) to FOLDERID_Downloads. After downloading the digital signature is verified - the file is only kept if the file is digitally signed and could be verified correctly. If you want to distribute your own modified TortoiseGit packages in your network, you have to put your own GPG key into TortoiseGit and sign the .msi-files with this key or deactivate the signature verification completely.